This Concise Companion gives readers a rich sense of how the poetry produced in the United States during the twentieth century is connected to the country’s intellectual life more broadly. Helps readers to fully appreciate the poetry of the period by tracing its historical and cultural contexts. Written by prominent specialists in the field. Places the poetry of the period within contexts such as: war; feminism and the female poet; poetries of immigration and migration; communism and anti-communism; philosophy and theory. Each chapter ranges across the entire century, comparing poets from one part of the century to those of another. New syntheses make the volume of interest to scholars as well as students and general readers. Stephen Fredman is Professor of English and Department Chair at the University of Notre Dame. He is the author of three books of criticism; Poet’s Prose: The Crisis in American Verse (1983), The Grounding of American Poetry: Charles Olson and the Emersonian Tradition (1993), and A Menorah for Athena: Charles Reznikoff and the Jewish Dilemmas of Objectivist Poetry (2001). He has translated three books from Spanish and is also the author of Seaslug, a book of poetry. American poets’ response to war, with particular attention to Ezra Pound, Gertrude Stein, Allen Ginsberg, Robert Duncan, George Oppen, Susan Howe, and Lyn Hejinian. How US poets responded and reacted to British poetry, in particular, Romanticism, focusing on Robert Frost, Ezra Pound, T. S. Eliot, William Carlos Williams, Wallace Stevens, Marianne Moore, Cleanth Brooks, Charles Olson, Frank O’Hara, and Adrienne Rich. Twentieth-century poetry developed in the context of evolving feminist thought and activism, as demonstrated in the work of Marianne Moore, Gertrude Stein, H. D., Muriel Rukeyser, Gwendolyn Brooks, Sylvia Plath, Adrienne Rich, Sonia Sanchez, and Harryette Mullen. Barnes, Hart Crane, Frank O’Hara, Robert Duncan, Jack Spicer, and Allen Ginsberg. Carlos Williams, Frank O’Hara, John Cage, John Ashbery, Jackson Mac Low, and Susan Howe. Discusses the effect that the blues and jazz have had on twentieth-century African-American poets, including Paul Dunbar, Langston Hughes, Sterling Brown, Robert Hayden, Gayl Jones, Yusef Komunyakaa, and Michael Harper. poetry – WASP to African American, Jewish to Latino/a, Euro-American to Native American. including discussions of Muriel Rukeyser, William Carlos Williams, Genevieve Taggard, Wallace Stevens, and Kenneth Fearing. Why mysticism appeals to American poets and how it affects their poetry, focusing upon Ezra Pound, H. D., T. S. Eliot, Robert Duncan, Charles Olson, John Cage, Gary Snyder, Allen Ginsberg, Denise Levertov, and Fanny Howe. Olson, Ron Silliman, Myung Mi Kim, and Mei-mei Berssenbrugge have responded to modern technology and the new sciences of physics and genetics. Ezra Pound, T. S. Eliot, William Carlos Williams, Gertrude Stein, the New Critics, and many others. This book offers a fresh and comprehensive reading of modern American poetry in several important ways. It takes in the whole of the twentieth century instead of dividing into decades like the twenties and thirties or into periods labelled Modernism and Postmodernism. Moreover, instead of focusing on individual poets, the successive chapters relate an often overlapping range of poets to the crucial and defining cultural issues within which the poetry took form and direction and to which the poetry spoke. Stephen Fredman has assembled an extraordinary group of critics to write the chapters. There is nothing else like this rich and trenchant book in the field of modern poetry. 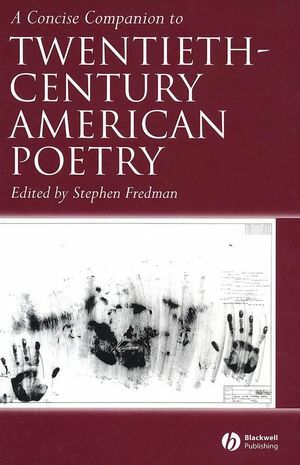 If I had to recommend a single book on the culture of twentieth-American poetry to students or colleagues, I would choose Stephen Fredman's Concise Companion. Fredman wisely decided to treat the entire century as a whole rather than adopting the usual Modernist/Postmodernist division or treating decades and poets separately. From the opening "Wars I Have Seen" to the final treatment of philosophy and theory in U.S. poetry, Fredman's contributors carefully examine the intersecting worlds of our poetry-- the New York art world, the impact of various diasporas, and the curious intersections with politics, gender, and religion. Yet the poetry itself always comes first, and no reader can fail to profit from these clearly written, concise, and truly expert chapters. A wide-ranging overview of twentieth-century American poetry and its contexts. Gives readers a rich sense of how the poetry of this period is connected to the country’s intellectual life more broadly.